On February 18 the Port of Vancouver USA welcomed the Brighten Trader, commanded by Capt. Marcelino S. Ecobiza from the Philippines, on its maiden voyage to the U.S. The Brighten Trader is operated by Victoria Ship Management Inc., owned by Sea Queen Shipping Corp. and was represented by General Steamship Corp. The vessel, which is 590 feet long with a deadweight capacity of 39,310 metric tons, was built in China and launched Jan. 12, 2017. 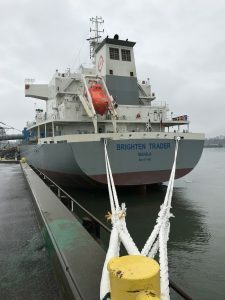 The Brighten Trader was loaded with approximately 10,500 metric tonnes of copper concentrate at the Port of Vancouver before sailing to Vancouver, B.C., to load additional concentrate cargoes. The vessel will head to Japan and China after its stops on the North American West Coast.